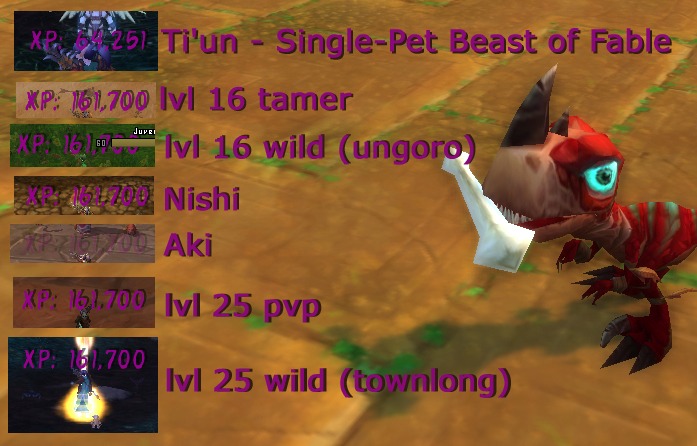 Time for a new Pet Leveling Challenge update. I have to say that I did wuss out a little bit. I’m still doing things only by pet battling, but I ‘allowed’ myself to start doing pet daily & weekly quests. It was extremely time-consuming to travel from place to place on foot, and there was really no way for me to gain any coin, so it would’ve been this way forever. I wasn’t even able to use the taxi service. Ugh. I’m not going to be flush with cash at all, especially because I’m still avoiding the Auction House as a part of the Ironman rules. I also transferred her from my mega high pop main’s server to a different one when they opened up free transfers, so now when the queue on the main’s server is too long I can still log onto this character. The result of both of these actions is that idea of logging onto that character doesn’t make my skin crawl anymore. While it would’ve been cool to hit level 90 in Northrend on foot, the idea of having to, for instance, walk all the way from the Alliance base in Howling Fjord to the area where fjord worg pups live alone made it extremely unlikely she’d be hitting 70, let alone 90. The reason I mention the worg pups is because mine is still Common quality. I figured while doing this challenge, I’d have more than enough opportunity to capture all the rares in the areas I could access (places like Pandaria and much of Cataclysm content are still off-limits, because you have to complete a quest to access them). Getting those rares make for an easy carrot as I’m grinding through this punishing slog, but I’m so sick of looking at my remaining Common pets, especially as I level other alts through Northrend. Those worg pups are right there. Just right over there. Sigh. And that’s a big part of why I’m kicking this leveling project into high gear. At this point, I’ve been avoiding leveling the bulk of my stable, because once my pets get too far above the level of wild pets, I have to go on only PVP fights until I level my character and schlep to a new area. I’ve been in the Arathi Highlands for ages. It’s really difficult to say, especially as I get toward the top of the pet levels curve, just how many I’ll need, so almost all my pets have been in stasis around level 11 until I can get this done. 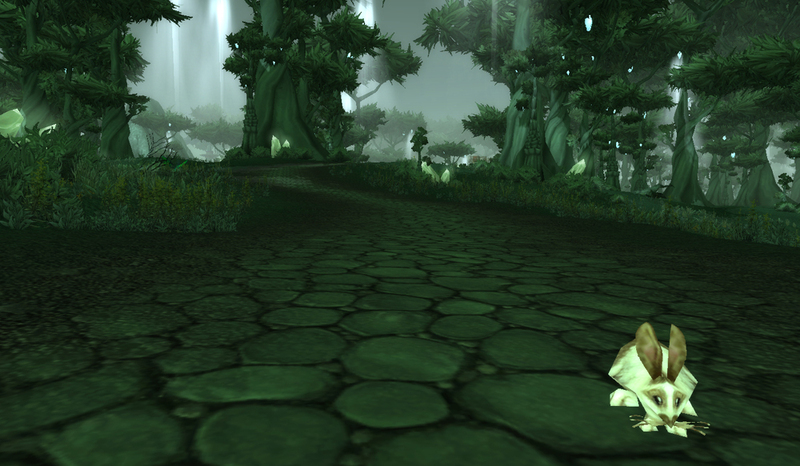 Warlords of Draenor is right around the corner, so I really need to get a move on here. The other thing I have to report is that, because of this project, I’ve been doing a good deal of playtesting about player XP through pet battles. I’ve made a previous post or two on the topic. This is a level 88 character, battling with a full team exactly the same level as her opponent. So, once I’m able to roll around Swamp of Sorrows or Un’goro Crater, that’s it. That’s the most XP I can get from a battle, as long as I’m not trying to fight single pets. The player XP also scales down if I fight with pets slightly higher than my opponent (around 20K XP per pet level at this player level). 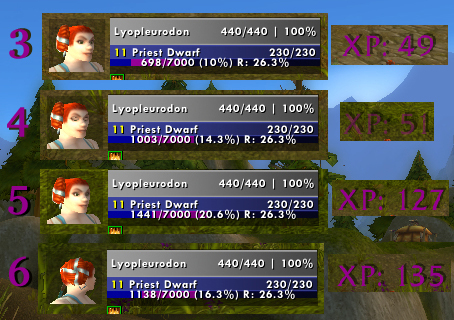 The only scaling in player XP from there on up will come from my leveling up. This is kind of both awesome and awful. I am glad I don’t have to rush to Northrend, but I’m curious how quickly that scaling will happen, and just how quickly I’ll want to ditch this project again. This entry was posted in Pet Leveling Challenge and tagged infographic, leveling challenge, pet pvp, the other kind of leveling on November 14, 2013 by Liopleurodon. In the previous post we discussed the general ideas for building a team. In this post, I’m going to build a brand new team for PVP step by step. Of course, at first we’ll begin with a little gloat about how super awesome my brand new Xufu is. So cute and bitey, awww. Xufu is a unique–well, more prestigious than unique–pet, so I really want to experiment with him in PVP. Using what we learned about synergy in the previous posts, we’ll look closely at Xufu. Xufu‘s 6 abilities are Spirit Claws, Feed, Vengeance, Bite, Moonfire, and Prowl. There are 2 different builds we can use for Xufu, generally speaking. We can either take Feed (middle slot, top), or we can take Moonfire (middle slot, bottom) and Spirit Claws. Vengeance (last slot, top) could be fun, but is a bit dependent on your opponent. If you go up against, say, a Call Lightning team it would be a wasted ability, but if you go up against another Xufu with a prowled spirit claws it would be a really big hitter. So, it makes more sense to just go for the prowled spirit claws, I think. As discussed in the previous post, synergy is a huge player in PVP. So here, I’m going to be a little bit daring, and rather than keeping Moonfire on Xufu, I’m going with the ultra deadly self-heal Feed, and find another pet that applies Moonlight. The first tool I go to to build my teams is typically Wowhead. With their filters, I can look up things that cause weather effects for starters. As of now, there are 3 abilities which cause Moonlight. Moon Tears is one option. The only thing is, Xufu is a Beast, and so is Moon Moon, making this team especially vulnerable to mechanicals, a very popular family in PVP. That Howl synergy though, man. Hmmm. Starfall is kinda cool in the tooltip but in my experience doesn’t really do a ton of damage or healing in practice. At a much shorter cooldown that might be an option, but at this point it’s not really worth it. So, Moonfire it is. I’m going to be sending this pet out first in nearly every situation, so I want it to be kind of hearty, to test the waters. As a result I’m going to nix the nether faerie dragon and sprite darter for now. Their dodge mitigation could be excellent, but other than that they’re made of paper. Harmonious Porcupette and both the Moonkin Hatchlings are excessively rare right now, so my getting rid of them for consideration is totally for your benefit and not at all because I don’t have any of those pets. Nope, not at all. Between the Celestial Dragon and Emerald Whelpling, I’m going to go with the Whelpling. Celestial’s Breath offense is kind of lame, and its heal is self-only. The Whelp will give us a magic Bite, which will be boosted by moonfire, too. For the 3rd pet, we have a few options. We can use a supplemental buff pet, a defensive pet, or an offensive debuff pet. 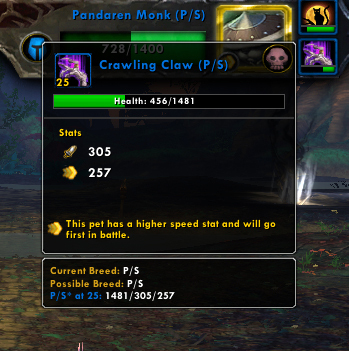 Many of the trickier debuff pets (eg, my pvp BFF, the Zandalari Raptors with Black Claw) won’t really work here, because both our chosen pets have single-move abilities, not DoTs. Since both the Whelpling and Xufu have a move buffed by Moonlight, I figure I may as well go with a 3rd. The only non-Spirit Claws, non-Magic ability buffed by Moonlight as far as I can see is Creeping Fungus. So, now we go to the game to figure out which we’d like to use. 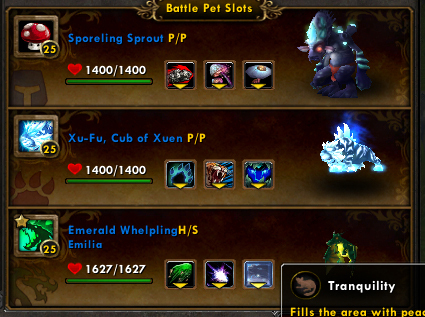 Among the pets with that ability, I think I’ll go with the humanoid Sporeling Sprout. The Fungal Abomination might be a better pick here, because it has an offensive self-heal, but another important part of team building is looking at your own roster and improvising. My Sprout is way higher level than the Abomination. I’m pretty sure you don’t want to sit through yet another Eye Of The Tiger montage. Also, I get that per-round Humanoid heal when the Sprout is in the back row, which can be good for a damage over time strategy. Well. I’m not sure I’d call that entirely viable. Maybe with the higher health Abom and a bit more practice figuring out where to set which pet in rotation it would go a bit better. A big flaw here is that, while the dragon can kind of hold its own, and Xufu can definitely hold its own, the sprout is really offensively weak. I’m thinking we can make a swap and really make this combo deadly. My first thought is going back Moon Moon for Howl. But, those initial family vulnerabilities exist and to make this combo really work I’d have to use Moon Moon’s Magic abilities. If we went up against a single mechanical (attacks strong against Beast, defends against Magic) it would probably wreck my entire team. 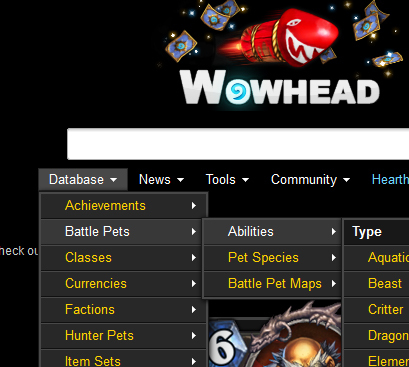 Back to WoWhead! There are 3 different types of abilities to consider. The Shattered Defenses buff caused by Swarm-style abilities is generally a huge liability in PVP, because you have several ‘down’ turns where you don’t deal a ton of damage, but your opponent can swap around and nuke you however they’d like during that time. It has its place (another post for another time!) but we’ll ignore those this time around. Then there are 2-round, 100% extra damage taken Howl-style debuffs and 3-round 25% extra damage taken Acidic Goo-style debuffs. In looking at Acidic Goo, I also notice Unholy Ascension. Unholy Ascension is probably the best move here because it debuffs your opponent’s entire team for 9 turns, but it bugs me to have a key point of strategy that only applies after you lose a pet entirely. 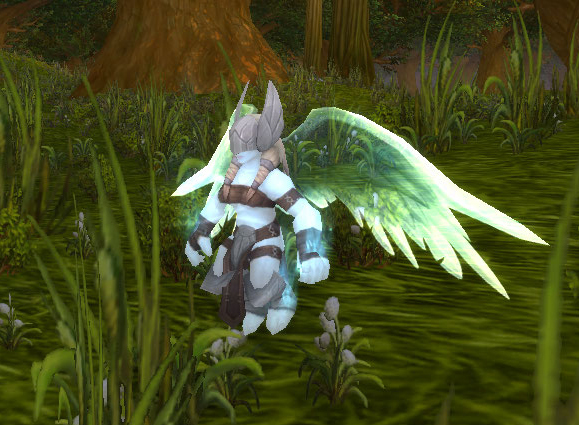 But even before that, the Val’kyr is really strong offensively. At this point I’ll continue to woodshed this team, but it’s just about there, I think. It may need some additional tweaks in terms of makeup, but it’s definitely possible that I just need more practice with it. And yes, I would call that matchup successful and the previous one less so, even though I won the first bout and had a pet left to beat with nearly full health. If my opponent hadn’t randomly passed in the first match I most certainly would’ve lost. In the second match I had a stall pet, which wasted much of my Valk’s buff, and 2 other pets that attacked strongly against my frontline offense. This is something you’ll get a better feel for as you develop more teams. And now it’s your turn. Try taking that one pet and build a team around it. If you share your results here, I can help you work on it, too. This entry was posted in Pet Battles 101 and tagged 101, pet pvp on October 10, 2013 by Liopleurodon. Not to get all behind the scenes-y on you, but I look at my wordpress analytics stuff on occasion to see what people are looking for help with. Though really I ought to write more about Unknown Search. So, so helpful. 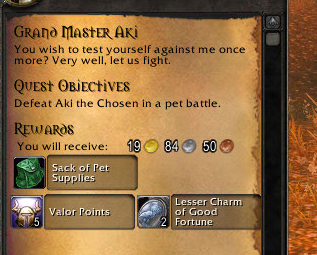 Right now, the thing I keep seeing searches for, and twitter questions about, is pet pvp. It runs the gamut from queries about advanced tactics to just the simple, almost desperate, “pet pvp help”. Though I have been mentioning how fun it is for a month or two now, I haven’t really written much to ease somebody into PVP. Since I just got a relatively glowing plug from that one guy on Eviscerated who does pet battles on this week’s (NSFW) podcast, coupled with ongoing PVP queries from my analytics, I figured it was time to do a beginner’s guide to pvp. Let me preface with a reassurance that there’s nothing to be afraid of. At worst, you’re going to be out 10 minutes with nothing to show for it. Let’s be real. We’ve all spent more time than that sitting in far-flung nowheres while we’ve waited on rare tames. Lots and LOTS more time than that. Let’s also say this right now: you are going to lose. Like, a LOT a lot, to begin. I still lose a third to a quarter of the matches I fight, which is an alright win percentage from what I understand. The thing is though, the more you do it, the more you learn, the better you get, the more you win. My experience is that you should pick 2, maybe 3 teams and use them until you know them in your sleep. This can be a flavor of the month team, like a force swap or a Kun-Lai Runt team, or build one on your own with one of your favorites. I’d recommend starting off with at least one team you know can be successful rather than try to build all your own, but if it doesn’t feel fun to play to you, try a different one. You can’t force a playstyle you hate to feel fun. 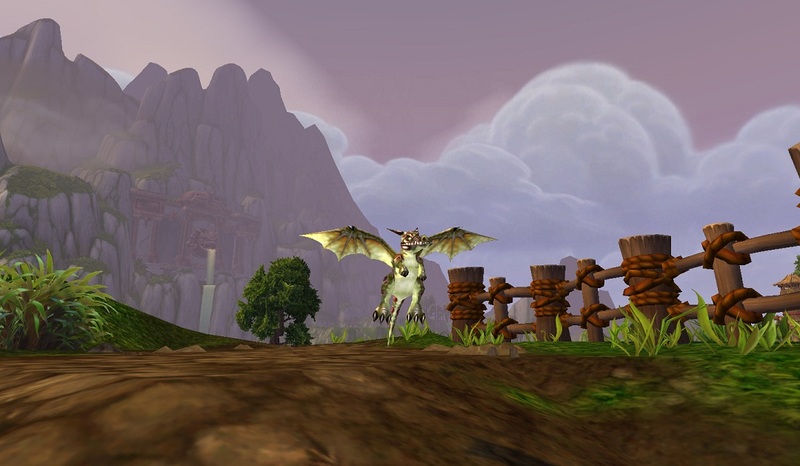 I’d recommend listening to the WoW Pet Battle Crew podcast or occasionally Res from the Eviscerated podcast for ideas here (though I need to stress for my younger readers that this is an adult podcast), or this thread on the official forums for ideas on a team you might enjoy. Or, you know, read my site too, or whatever. 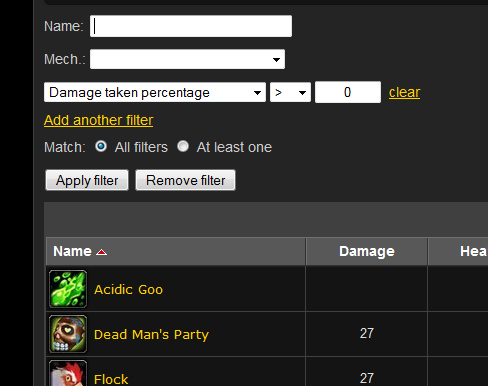 That said, unfortunately for my analytics, there is no best pet pvp team. There are good ones to be sure, even overpowered ones, but nearly all of them can be countered once you get a bit more experience. The funny bit is, as you PVP more, you’ll see these team comps constantly, so you’ll know exactly what’s coming as soon as you enter into the match, and you’ll learn how to play your team to beat them. One of the more overpowered pets, the 3 baby Direhorns, are all mowed down really quickly by my gnome, moreso if I combo it with a debuff. In my experience, buffs and debuffs play a much larger role in PVP than PVE. Though you got a taste of them in first doing so in the Aki fight, players are far more savvy at combining big damage abilities with vulnerability debuffs than NPCs. In general, speed plays an enormous role in PVP, and thus so do speed debuffs, but there are a myriad to watch out for… if you have a debuff up, pay attention to what comes next! You don’t have an actual physical location when you pet PVP, so you don’t have to worry about the other kind of PVP. Also, your opponent is a placeholder graphic (why I can’t say) so you’re not actually fighting some jerk priest who managed to nab tier 3. Very unlike PVE, your setup before you queue up doesn’t matter, as you and your opponent both get to choose your first pet after you zone in. This gives you about 30 seconds to look at their team and decide what you want to do. For my teams, I almost always pick a tank pet to lead off, like the Scourged Whelpling, the Crawdad or a Direhorn (though the Direhorn makes a good closer, too). I can take a move or two to figure out what the other team’s gimmick is going to be. Swapping your pets in PVP is far more beneficial than it is in PVE. You only very rarely ‘lose’ a turn the same way as you always do in PVE. In fact, your decisions in which pet to play in what order can seriously affect your chances to win. In my Black Claw team, I almost always let my Kneebiter die first, because both my Gnome and Whelpling have failsafes after they die, but I try to make sure to leave the Whelp for last if there’s a pet with heavy elemental damage, because it’ll chew the gnome to bits. Reverse that for critter damage and the Whelpling. Having an Undead pet for your second to last pet is a really excellent idea, because if you win the match on your resurrect round, with no pets left, the fight ends in a draw. In that case, I do forfeit. People have very different ideas on etiquette here. Personally, with the one exception I mentioned above, I like to play out every match as hard-fought as I can, to see what the other pets can do, to see what their weaknesses are. Some people think this is rude, and think you should forfeit as soon as you ‘know’ you’ve lost. We’re learning, and they can just forfeit if they don’t like it. Besides, you never know what you might be able to pull off at the very end. If you (yes *you*) would like to, you can contact me on twitter or add my battletag Liopleurodon#1882 to duel for some practice. Or, if you feel I’m a know-nothing noobie noob and want to smash my pets and make me cry IRL, I’ll duel you too. Believe it or not, after you get into pet PVP is fun even when you’re losing. You just get better stuff when you’re winning and paying attention to your analytics Kardashian baby Amanda Bynes (I think this is how it works). This entry was posted in Uncategorized and tagged pet pvp on June 28, 2013 by Liopleurodon. I know I’ve often waxed lyrical on my love affair with my crab Ishmael, but I may be cheating on him just a little with my Scourged Whelpling, Radley. Come on, who wouldn’t want to rub up on this? Couldn’t you just kiss that little toothy, rotting, plague-infested… um, forget I asked. Right now, the Scourged Whelpling might be my very favorite pet of all pets. The only thing he kinda stinks at is taming… he has mostly damage over time abilities, and his single nukes all hit really hard, so he’s reserved for straightup killing, and whoa boy does he deliver. He’s been one of my favorites for PVE stuff for a while. 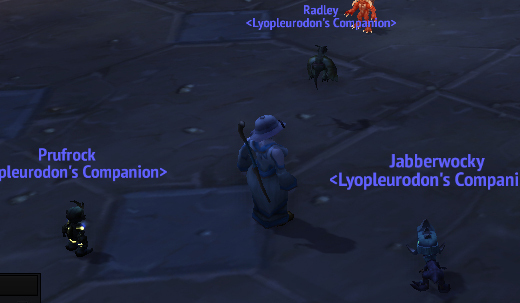 Radley has been featured in my Aki strat and my Burning Pandaren Spirit Tamer strat already. He’s so hardy he can decimate any wild pet he runs across, even the critters he’s vulnerable to. PVP is where he is suddenly scintillating for me. Mostly because, yanno, I only just started to PVP. He’s key in nearly any damage over time team. 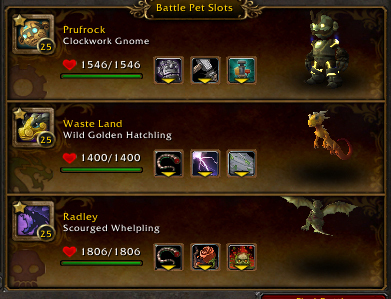 He was featured in the clockwork gnome/wild golden hatchling synergy combo I started PVPing with (discussed briefly in my post about the clockwork gnome). My current team, making heavy use of Black Claw (which I’ll be discussing in a future post, really soon!) also uses the Whelpling. Really, nearly any team which is heavy on the DoTs will benefit greatly from using him, because of his high health, undead type (which helps to beat up those damnable Kun-Lai Runts) but mostly because of his Plagued Blood ability. This ability has no cooldown and debuffs the current pet. 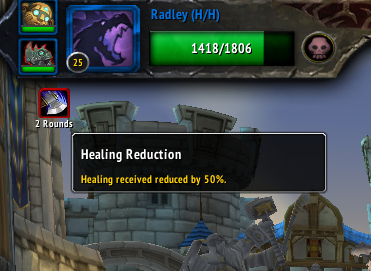 It heals you each time you strike the pet with the debuff, for roughly 50. This means that each time a DoT ticks or turret fires or death & decay ticks, you get a heal. This can end up being tricky to manage, since all they have to do is swap out and you have to reapply the Plagued Blood for the new pet. With a heavy swap team, or going against a force swap team, this can be a huge pain. It can also be problematic with the turret, because unlike something like a Shrine Fly‘s DoTs directly on the opponent pet, when your opponent swaps, you lose that healing until you re-apply Plagued Blood. So, how do you find one of these elusive little guys? Honestly, this is a really tough tame, even now. Your best bet is to just park an alt the area in Icecrown where they spawn, and check every so often, especially just after a cross-realm server restart. 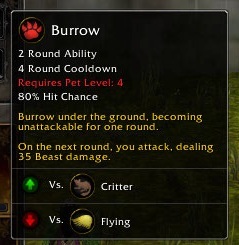 This is one of the pets I see people saying they created a DK on one of the rp-pvp servers for less competition, too. I know I’m kind of a jerk for spotlighting such a difficult tame, and it probably reads more like ‘haha look what I got suckaaaa.’ A Restless Shadeling is an alright substitute in some DoT teams, but is kind of a pain to tame too. Luckily, you only have to do it once, and this guy will be yours for long walks on the beach, or glamour shots in the sun. This entry was posted in pet profile and tagged pet pvp, tamed, undead on June 3, 2013 by Liopleurodon. First of all, pet PVP isn’t that bad. I’m not sure why I was hesitant to get into it from a ‘I’m gonna lose so muchhh’ perspective. Even though, let’s be real, I started off losing pretty frequently. Now I’ve leveled off to winning roughly 4 out of 5. The issue now is that there isn’t a ton of reward for it. 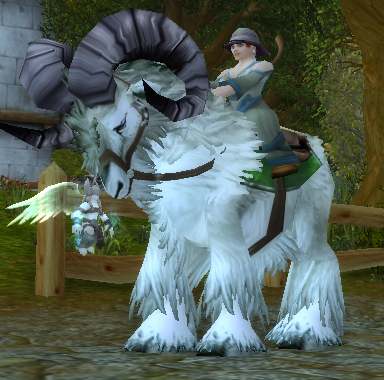 Yeah, cute little direhorn. And right now I’m getting exactly 1K XP per battle I win at level 17, so that’s additional incentive. But other than watching my win totals go up (which right now that’s bugged and I’m not properly being awarded achievements or wins for my weekly quest, so that may have something to do with my disenchantment here), and that weekly quest, there isn’t any way to progress. I keep getting these cruddy green upgrade stones and that’s about it. Because of how long the battles take, dozens and dozens of turns, that 1K XP is just barely beating out grinding lowbie squirrels. Throw a loss or two into the mix, a longer queue time, and it completely tanks my XP per hour. If this is your first time PVPing, I’d encourage you to just keep at it. I know I still have a lot to learn. I mean, if you’re raiding you don’t say “well, Kel’Thuzad did this thing I haven’t seen up to this point, I guess I should just give up.” Same goes for lil KT. Don’t give up! Pretty much the whole time I’m doing pvp, I like to keep this song in mind (no really). If your team combo doesn’t seem to be working, try a new one. My composition right now is my Wild Golden Hatchling with Call Lightning and Cyclone, my Clockwork Gnome with his turret, and my Scourged Whelpling with Plagued Blood. I make a lot of swaps, and if I come up against another heavy DoT team or a team with a pet that has a shell shield ability I could be in trouble. But for now, it’s working out pretty well for me. PVP has a steep learning curve, because you need to know your pets’ abilities to the utmost, but you also need to learn everyone else’s pets’ abilities, frequently on the fly. I’m pretty sure part of the reason I’m having success here is because the Wild Golden Hatchling isn’t common for pvp, so people aren’t too familiar with what it can do. I feel sad for some of the people I’ve been fighting, too. That isn’t meant to be a brag or elitist comment. I’ve beaten people with green quality pets, clearly just standing on their wobbly pet battle legs for the first time like baby fawns. It makes me almost wish I could find these people afterward, to tell them they’re just not going to win with a team made up of an un-upgraded Wolvar Pup, a snake and a breed 13 rabbit. And of course, there are also the maddening tri-teams of triple speed rabbits, or triple Kun-Lai Runts, all named in such a way that make it obvious the player is just there to troll for lulz, so clearly being able to contact opponents isn’t a good idea in general. I just want to give some of those poor little tamers a hug and tell them to not give up. But those are both few & far between, and it’s mostly the close wins, or even if I lose by a huge bit, learning a new pet, that makes it fun. I’ll definitely continue to do this for the leveling challenge, because it makes it a lot more tolerable to alternate grinding & pvp. Were it not for this silly leveling challenge I’d get my 10 wins on the week and go do PVE until next week. I’m not asking for a currency-like mechanic like player PVP, though that’s how PVP avoids the same feeling of character stagnation. I’m not sure how you’d fix it, honestly. But, it’s so time-consuming I need a carrot other than ‘fun’. 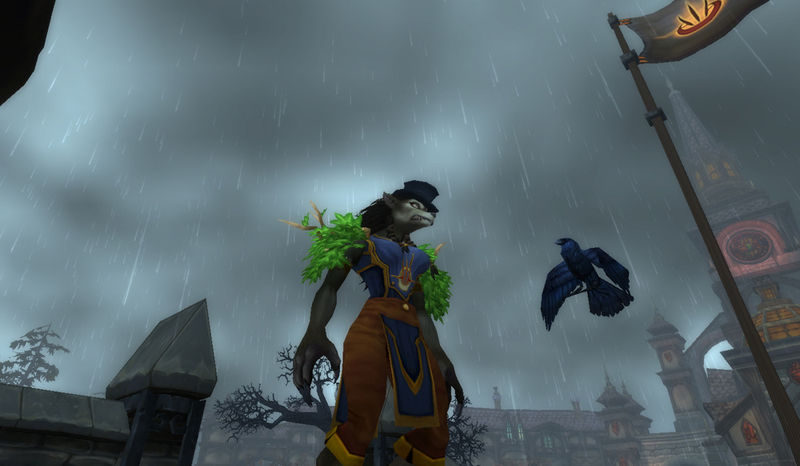 Speaking of carrots and wasting time, no I haven’t gotten a Val’kyr yet. 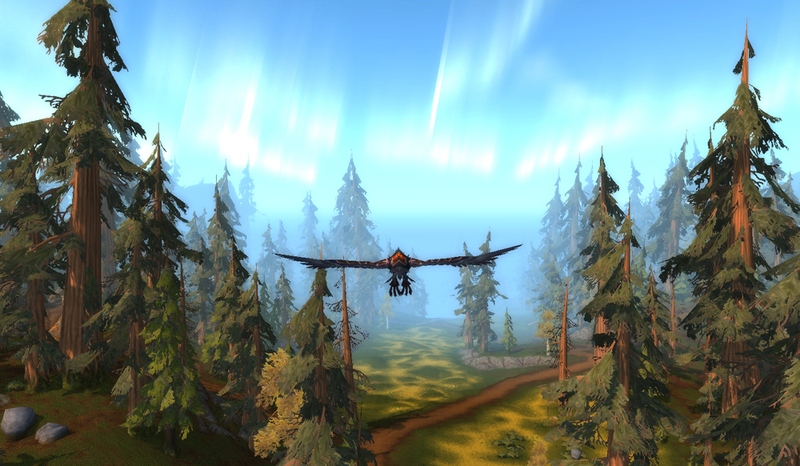 I tried for about an hour in Grizzly Hills, then went to go poke around in Zul’Drak for a minute. When I came back, it was obvious that I was no longer in the same CRZed Grizzly Hills as before. With the small number of spawn points, until we know more about how taming changes the spawn I can’t see devoting more time to this in the short term. I’m 1/10 for Raiding With Leashes 2 pets (got the waveling). 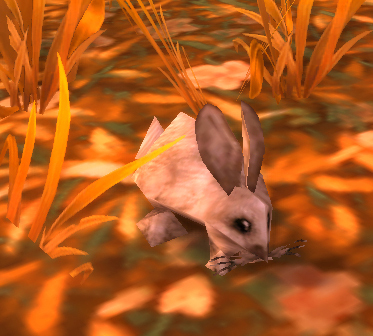 Later today I plan to farm some bones and maybe a baby direhorn, plus LFR for maybe pets. The Beasts of Fable are a lot harder, which is fun, and no I’m not being sarcastic for once. I felt since 5.2 that they were too easy to be the ‘epic challenge’ they were presented to be. As epic as flying around for an hour is, lol no. Apocalypse still functions properly, and Life Exchange does the correct amount of damage, though overall this is less damage, because the Beasts Of Fable’s life pool is relatively smaller. However, the Beasts hit much, much harder, and roaches and faerie dragons seem to be made out of wet paper, so using both is a no-go now. I’ve been using the Roach, plus 2 others based on the pet’s family type (eg, for Gorespine I used my Pandaren Dragonling and Darkmoon Zeppelin). 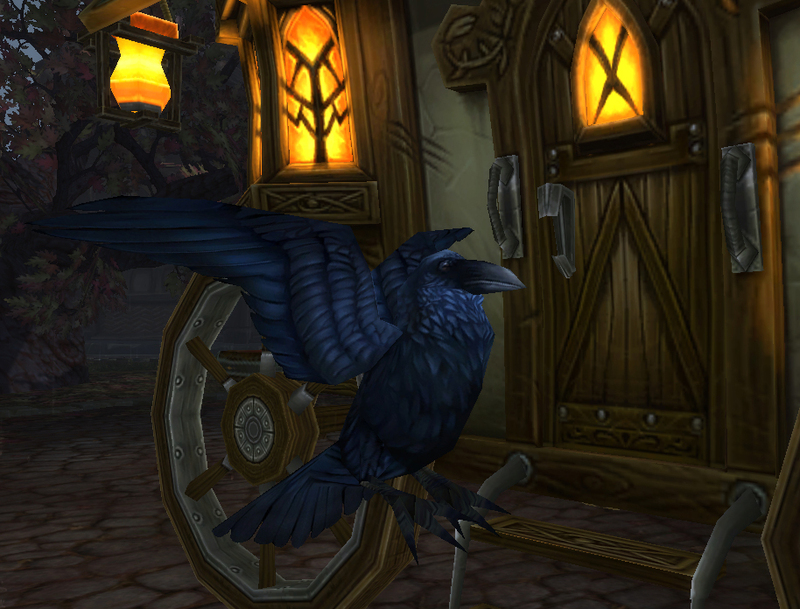 For the pets that heal, I’ve been using my Gilnean Raven equipped with Darkness, though there are better choices. You have to have something to cut that healing though, because otherwise it’s just silly. As to the Barrens stuff and story, I was really hoping that Alliance would get the kickass, “no sleep til Orgrimmar!” moment. I’d actually avoided the spoilers about it, because as soon as I read that line, I knew we were in for something really epic. Instead I got to tool around in a mechanical cat. I haven’t done anything in the Barrens since handing in my initial 15 resources, even though Gahz’rooki is on the line, because I’m really annoyed with this. I know that at this point this is the Horde’s story, but this feels slapped together. And just a tiny bit insulting. This entry was posted in Uncategorized and tagged 5.3, elite pet battles, pet pvp, unborn valkyr on May 23, 2013 by Liopleurodon. I was going to skip this post altogether and move forward, because let’s be real. Leveling is leveling. Nobody cares until you’re 90, and the previous post on the topic was me griping about how bone-dull boring it is so this is clearly a terrible move in terms of keeping an audience. I have a couple observations which may be important going forward, though. First of all, I found the breakpoint. Well, numerically speaking anyway. The huge jump in XP between level 4 & 5 is because the wild team gains a pet at level 5. So, you gain extra XP with each additional pet, which means the breakpoint where pet battling suddenly gets a whole lot better for player XP is probably around level 40-ish, when you can start battling level 15+ teams with 3 pets. No, I hadn’t. 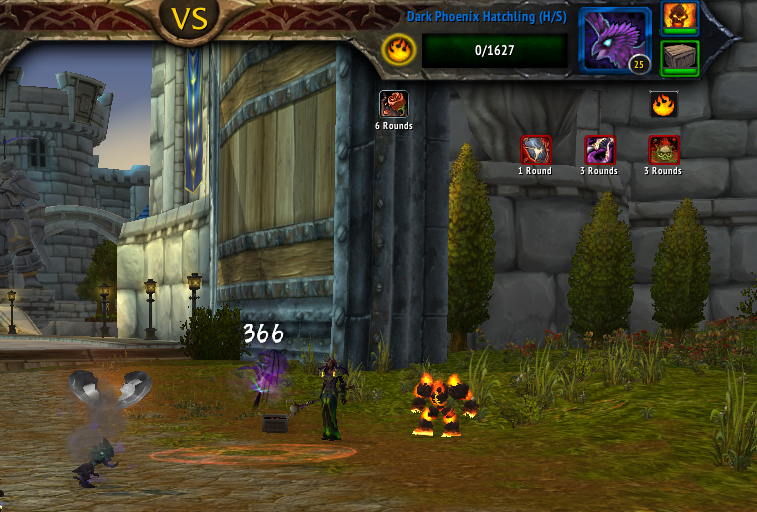 I’m really rubbish at pet PVP you guys. Really, really rubbish. I didn’t know that pet PVP gave you any kind of XP either. But that new green baby direhorn for winning 250 battles is coming in just a few days, so I figured I might as well give it a shot. And after some battling (SO MANY RUNTS) I finally won one. Contrasting the XP I got against that level 6 team, this happened. Oh. OH goodness. Now that’s a breakpoint. 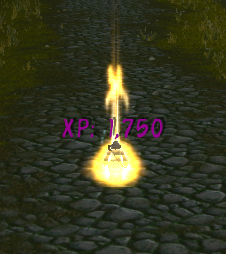 I also gained 150 XP for ‘discovering’ Darkshire, booya. The thing is, you only get XP if you win. All those times runts and brooms rubbed their butts all on my pets’ cold dead bodies I got bupkis, so this is only as time efficient as your queue and your pvp skill (and how trolly the teams you go against are… but Triple Turkey has been sort of quashed) allows. All it takes is 12 wins to level at this point. So, come 5.3 and its achieve for winning max level PVP battles, I will definitely be adding level 25 pet pvp battles into the mix. I still have a few lowbie rares to collect and there will be a post with me griping about that, trust. I’ll continue to do mostly wild battles for statistical purposes. The provisional nature of pvp XP, that you have to win to get XP, makes it so I don’t feel like it’s cheating the challenge (too much). I expect that once I’m high enough level to get to triple pet wild teams this huge spike will even itself out and it’ll be more efficient to battle wild again, just from the time wasted due to losses. For now, I’m going to move on to the southern part of the continent to do some more rare tames, and wait til Tuesday, when I’ll unleash my PVP prowess onto the world at large. 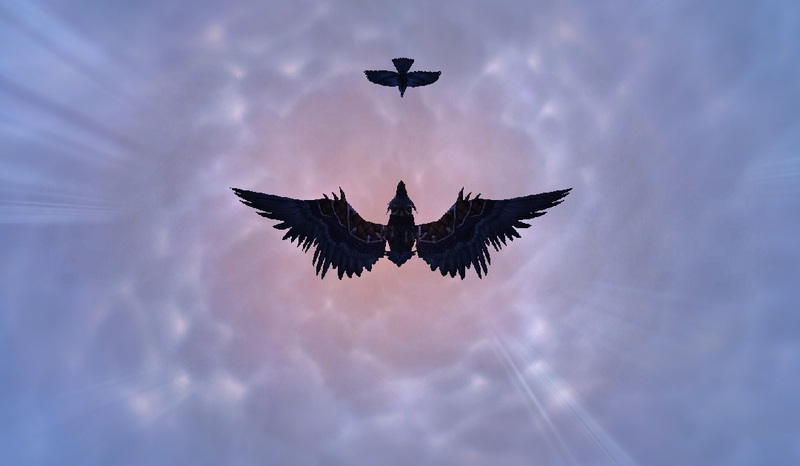 This entry was posted in Pet Leveling Challenge and tagged pet pvp, the other kind of leveling on May 20, 2013 by Liopleurodon. Since the PTR is finally (FINALLY) on a release build, I figured it was time to finally put out my 5.3 pets guide. Fun fact: On the PTR, you have no pets or account-wide achievements. Blizzard helpfully supplies you a couple super rare pets you’ll likely never get in-game though, so that’s cool, but it’s a crapshoot as to whether you get any pets you actually use on a regular basis. I got 2 poor quality Tolai Hares. So useful. As fun as it would be to re-form and re-tame and re-level my entire team, and then do all the tamer quests to try everything out? No. If you’re super interested in that, here’s a generic training montage. Close Enough. But there are still plenty of observations to be made just by looking through achievements, the pet journal, etc. The first I noticed was that all abilities now display a percent chance to hit, which is nice. By the way, Burrow has an 80% chance to hit. Spoiler alert. They’ve also removed the base 5% chance to miss for all abilities, but they also built in a % chance to miss on some abilities which formerly only had that base chance to miss. Each family has an ability which has a base guarantee to hit, too. The ‘base’ throughout here is to note that things like Blind still cause you an increased chance to miss where applicable. There is a longass list of all the ability changes in the full patch notes. This is also why, if you’ve noticed, I’ve stopped putting up guides for the past month or so. I have a couple ready to go, but I need to make sure they’re still valid before I put them up. Would be kind of silly to edit them less than a week after I posted them (I’ve been expecting 5.3 to launch ‘next Tuesday’ since I first started this post on April 5th, so). This may make them my new favorite way to earn… well, everything. They’ve also boosted the Beasts of Fable quest, making the Beasts more difficult (though by what measure I can’t be sure) but the rewards are better. The quest itself is broken up into 3 sections, so you don’t have to spend upwards of a half an hour travelling to do the entire thing every day. ANDPLUSALSO, the bag now has a chance to reward a new item which boosts your XP gain, which is pretty fantastic too (and my main gripe with the BoF quest, whee). ANDDOUBLEPLUSALSO, the Spirit Tamer bags now have a chance to drop upgrade stones, AAAAAND, there’s a new ‘luck’ mechanic where, if you don’t get a stone you get an unseen stacking ‘unlucky’ buff which increases your chance to get one, from both bags and battles. That’s a lot of alsos. 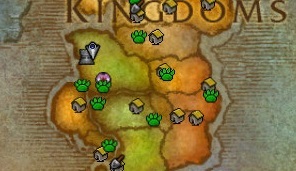 In 5.3 they start very helpfully marking the tamers on the map now. The paw prints persist even after you complete that particular quest or daily for the day, so you still need your ‘did I do that one yet?’ addon. 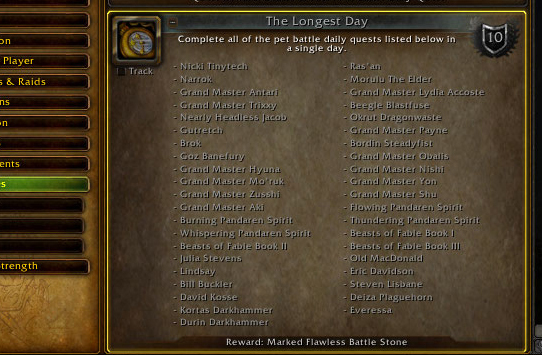 They also added a new achievement, “The Longest Day” for fighting all the tamers involved in dailies in a single day. All. I didn’t even begin to attempt this on PTR. The marked stone reward is nice (and BOA! ), but it seems like you’re really going to need to have all your strats down for all the tamers beforehand or this is going to take freaking hours, travel time aside. 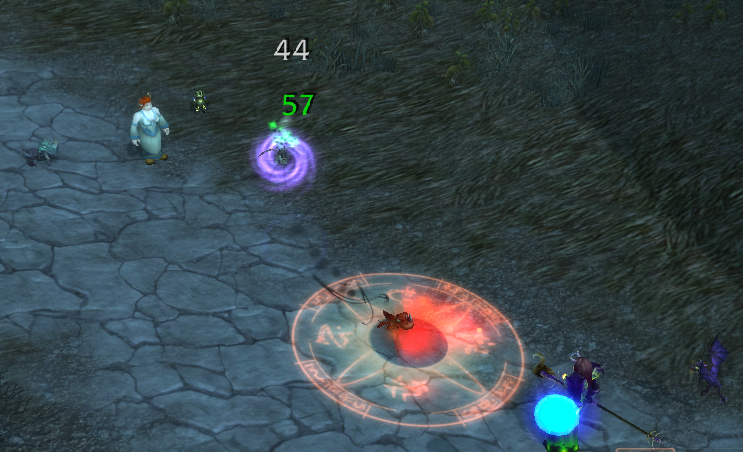 Also note that this is faction-specific… I didn’t have to go fight the Durotar Tamer, though I was in the area. This time there’s only one new pet to be tamed, the much-anticipated Unborn Valkyr. When I looked at the pet journal, I saw something… disturbing. “Northrend,” really? 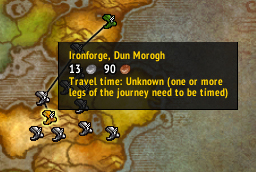 I can understand why they wouldn’t want to get more specific on PTR. but it’s like they want me to squander a couple Saturday nights flying around with the windows rolled down drunkenly yelling. But then, that’s nothing new. Like the psycho I am, I did exactly that. I started by going to the place @mumper took the infamous unborn valkyr teaser shot. I did a whole bunch of random stuff to try and trigger a spawn… jumping off cliffs, getting naked, moonfiring roaches and the like. Then, @mumper was all, HAHA MADE YOU LOOK it’s not even in the game yet! And then I blacked out and when I woke up got on an FBI watchlist somehow. 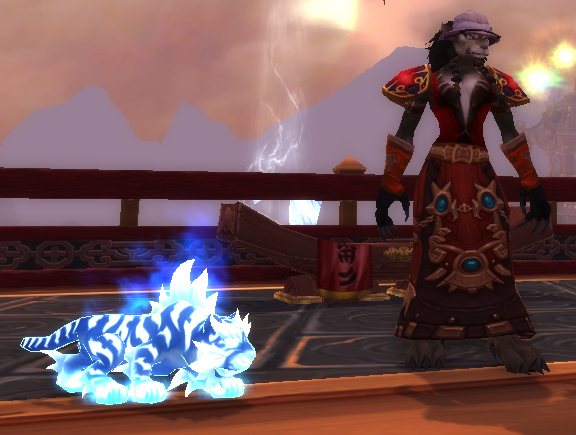 Immediately afterward, the random PTR pet system gave me one. That’s right. The computer was RUBBING IT IN MY FACE. And this pet is really gorgeous and well-done. Check those transparent wings! Right now, we know they have a ‘unique’ spawning mechanic. According to Mumper on Twitter, this mechanic is server-side, so you’re not going to find one by killing a bunch of vrykul or something. 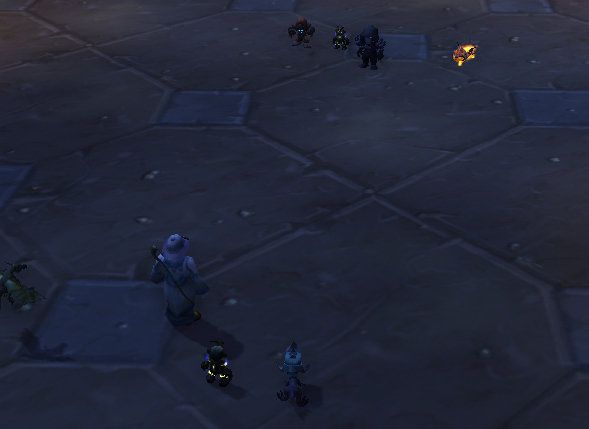 They are confirmed to spawn in the area around Icecrown Citadel. 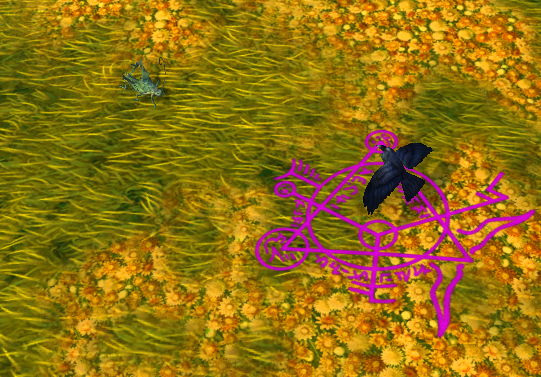 The current operating theory is that they spawn in the same places as rare mobs (confirmed sightings at Loque’nahak’s spawn point, as per wowhead comments). There’s a super cute mini-direhorn farmed from mobs on the Isle of Giants, so if you’ve been putting off your spectral porcupette, now’s the time. 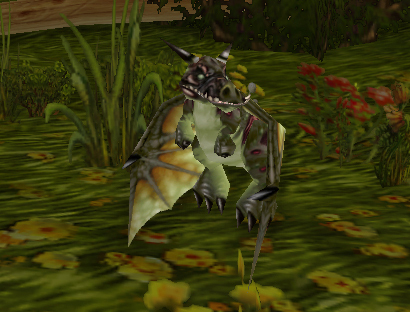 There’s also a new pet from the Isle of Thunder, farmed from the living piles of filth in the Saurok area. It looks like the piles of living filth. Ugh. 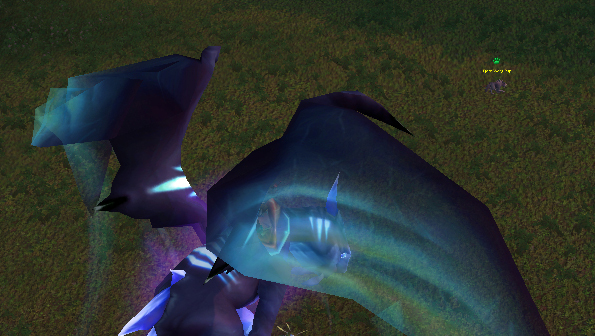 There are also 3 new pets from encounters in Throne of Thunder, so to prepare I’ve been farming the auction house. 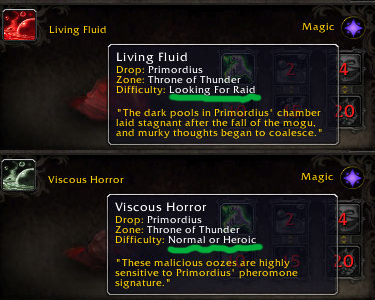 One is from only LFR Primordius and one is from only normal or heroic Primordius. So, the likelihood that I’ll get both (or really even one) is roughly the same as my character spontaneously becoming an Unborn Valkyr. The 3rd is another baby direhorn which drops from Horridon, because obviously. That one doesn’t specify difficulty level, and has the same look as the others, only more blue/aqua. There are a few new pets obtained via farming BC-era instances cheekily dubbed ‘Attunement Addition’. 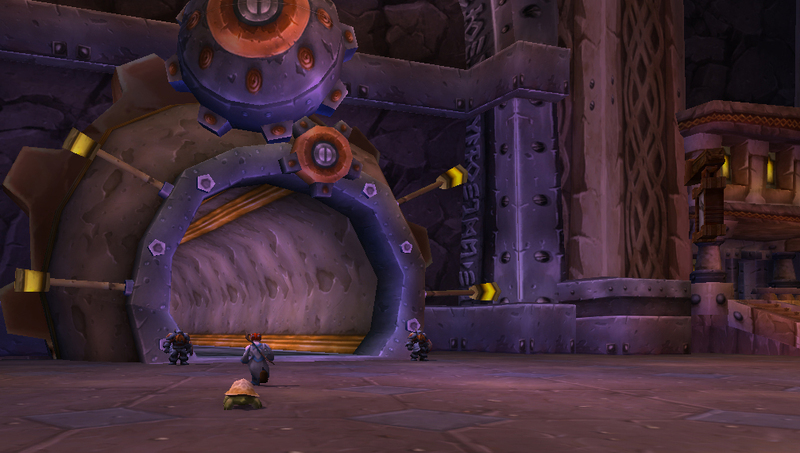 Thanks for the memories, Heroic Slave Pens. I guess. Karazhan, Tempest Keep and Serpentshrine Cavern are included, not the more grueling to attune to Black Temple or Mount Hyjal. If you collect all 10, it will net you the achievement Raiding With Leashes II and a cute Tito all your own. I soloed Kara a couple times and didn’t get a single one. It’s worth noting that Lil Bad Wolf’s note says he drops from Big Bad specifically, and I got the Romolo encounter both times. May be coincidence, as a sample size of two is hardly telling, especially combined with the murkiness of whether these pets were even live when I tried farming them. 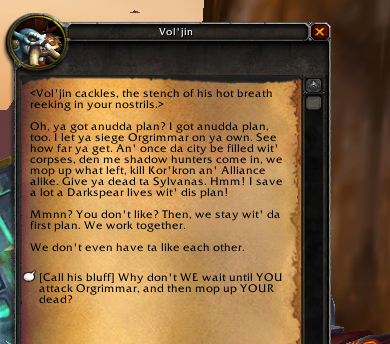 The other new pet of note comes from aiding Vol’Jin’s rebellion. You complete a couple scenarios and then *events transpire* (wiggly fingers! ), and the quartermaster is eventually unlocked. You have to do dailies and turnins for currency, then turn in that currency for pets. It’s kind of like every mid-expansion content we’ve seen thus far, now that I think about it. Huh. 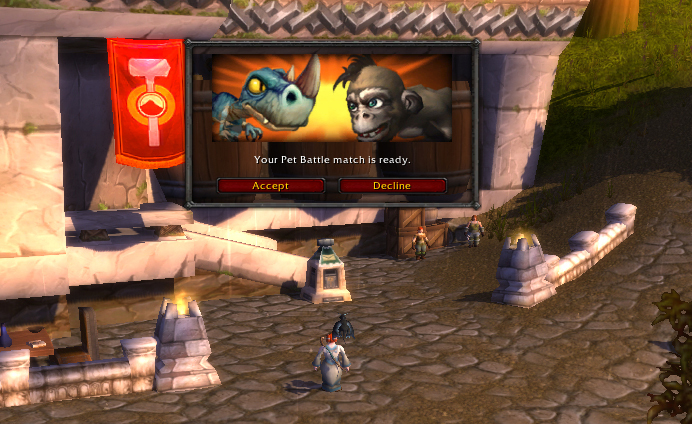 Unlike any content we’ve seen before, Spectator Mode for all pet battles is now live. 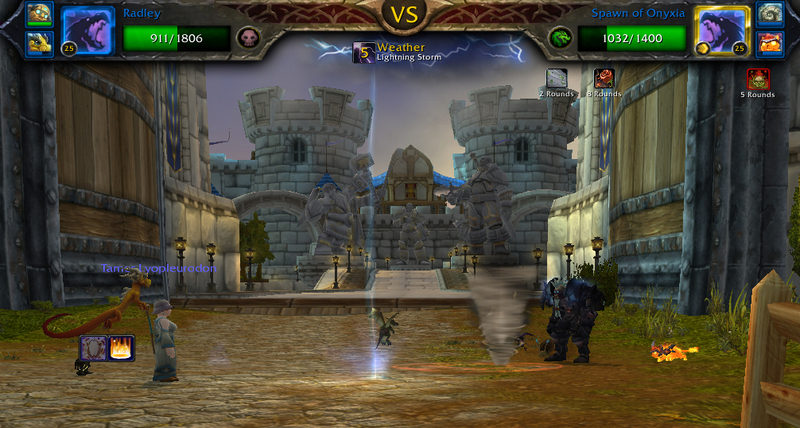 Sorry, Arena pvpers who’ve been asking for a Spectator Mode since Burning Crusade! Spectator Mode means whenever anyone battles pets out in the world other players can monitor your progress and see whether you’re battling or just standing there like an idiot. This includes cross-faction players on PVP realms, so get ready for the ganking to commence. 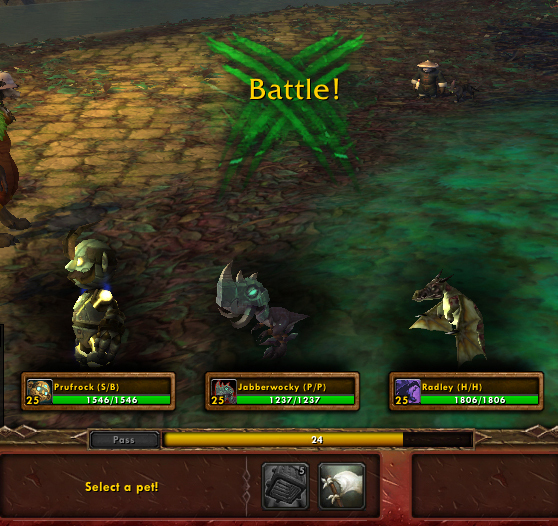 This also breaks pet battling in stealth, after a fashion… the battle is still played out for all to see, but your character is replaced by a placeholder. They have to hunt around a little to find & gank the ‘real’ you. Lastly, the one I’m dreading most! There are new pvp achievements. That’s not the part I’m dreading, but bleh anyway. This is an achievement with several ‘steps’. 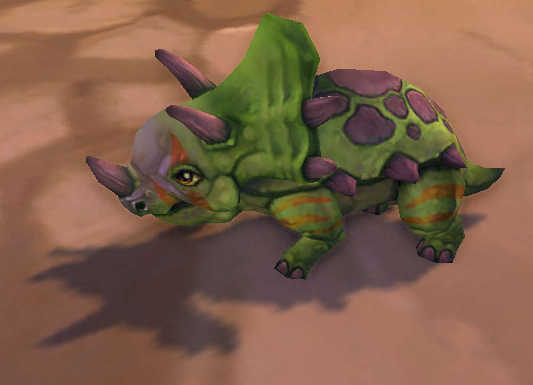 There is a really adorable new baby dino pet awarded for winning a certain, huge number of specifically level 25 Battle Finder battles. Yeah, of course the PTR awarded me this one, too. Jerk computer. Additionally there’s a new weekly quest you can complete by winning a lvl 25 pvp battle, too, but I haven’t familiarized myself with that at all. This is the bit I personally have been prepping for the most in-game. 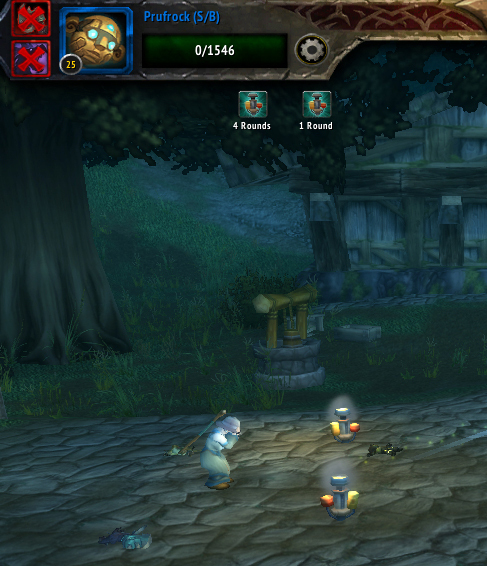 I have a few kun-lai runts, a few dragons and my trusty clockwork gnome ready to go. I get the feeling that these battles are going to be the easiest to do after a week or so of 5.3’s launch, so getting prepped for PVP now is the way to go. Most of the coolest stuff in this patch is about regular character play. I’d add ‘unfortunately’, but I have a revolution to go foment. 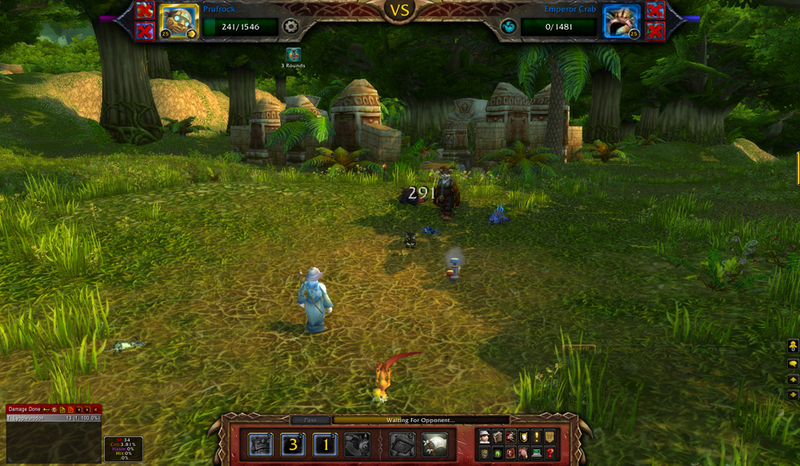 This entry was posted in Uncategorized and tagged 5.3, pet pvp, PTR on May 16, 2013 by Liopleurodon.